The magnitude or intensity that must be exceeded for a certain reaction, phenomenon, result or condition to occur or be manifested. Extreme sleep deprivation will push you to the edge of sanity’s cliff. Once you’ve crossed that threshold jumping is the only remaining option. In early 2016 a doctor directed me to stop taking a mental health medication incorrectly prescribed 7 years prior. Unbeknownst to me, withdrawal from this drug is considered markedly worse than heroin withdrawal, often lasting for 3 months or more. And so my unintended journey into a timeless world began. For 57 straight days I slept under 3 hours per night, if at all. It was as if someone had flicked the “On” switch in my brain and broke the “Off” option. No doctor, specialist, or endless combination of prescription drugs could put me to sleep. I learned that without sleep the “day” never ends. An evening is just a prelude to night that only leads to yet another morning, and the cycle repeats. As each new sleepless day passed I slowly descended the rungs of the sleep deprivation ladder as time lost its meaning. My world devolved into slow motion while the one around me continued on its natural rhythm. On day 58, after an extremely dangerous attempt to knock myself physically unconscious, I finally slept four hours straight for the first time in 2 months. By then, I had travelled so far past the threshold of sleep deprivation that the cadence of time became utterly malleable. My perception of it had been so permanently distorted that the only path back to cultural normalcy was to recreate the sensation for others to experience. A friend shared that she could fall asleep “at the drop of a feather” – a phrase that implies a task completed with ease. In deep hours of the night I would imagine feathers drifting slowly downward never hitting ground. This internal vision became a touchstone for my recovery while I regained my mental and physical health. In my studio I slowed down my movement and time while dropping feathers from above the camera for hours. Employing no digital manipulation or double-exposures, the Threshold series illustrates the physical passage of time through movement. 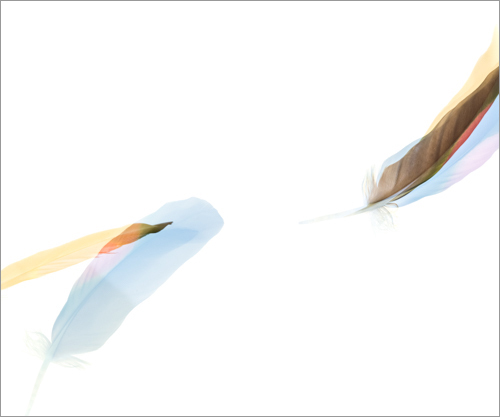 The resulting pictures capture feathers falling for a full second through different wavelengths of light while subsequently compressing the variations into a new form.